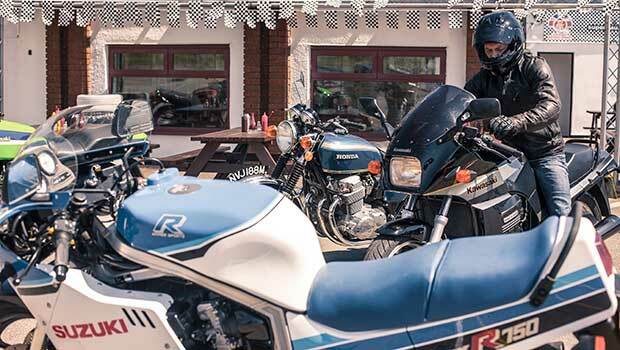 History is written by the winners and when the sports bike victors of biking Britain get nostalgic they see the original Suzuki GSX-R750 as some kind of sales-busting high watermark in motorcycling. Those of us who were there don’t quite remember it like that. Back then how a bike handled was interesting… if you had an Italian bike, but not half as important as how fast it went. All bikes went round corners somehow, we just didn’t know then how much better it could be. So, while the GSX-R750 was interesting, it was also expensive and still, ‘only a 750’. The hard men in my town still wanted bigger bikes with the mostest horsepower because, clearly they were faster. It was when Suzuki announced the GSX-R1100 at the end of 1985 that motorcycling really pricked up its ears. We were still too stupid in 1986 to understand that it was the lack of weight that mattered more than the claimed 120bhp, but at least the new bike had enough power to be credible at the pub (because back then we were also stupid enough to ride to the pub and drink beer). The all-new GSX-R1100 claimed 10bhp more than Suzuki’s existing GSX1100EF, but it also weighed a humungous 41kg less and had a wheelbase 90mm shorter. The new engine was powerful, quick-revving and a world away in its delivery from the old GSX motor, but it was still flexible and torquey because the race-ready flat-slide carbs on the 750 had been replaced with road-friendly CV units. As on the 750 the new engine avoided the extra faff of water-cooling by using the added faff of oil-assisted air-cooling. Essentially this meant the GSX-R had an enormous oil cooler and powerful oil pump that shoved the lube around the engine and through the cooler at a much higher rate than a conventional motor. A whole load of extra oilways sprayed more oil over more places in the engine more efficiently and this removed the need for water-cooling. As it turned out the standard GSX-R1100 engine didn’t make that much power anyway; 110bhp at the back wheel was disappointing, but not entirely unexpected – the GSX-R750’s clamed 100bhp had been equally optimistic, but, as few people had access to a dyno back then, no one really cared. For those with the funds to replace the one-piece exhaust with a race pipe (Vance and Hines or Eagle were the pipes of choice) and an ignition advance kit there were ten extra bhp lurking inside a standard engine, but on the road you didn’t need it – a standard GSX-R was faster than anything else around by some distance. It was the lack of weight that made the difference. My favourite local dealer explained it like this. ‘Imagine being chased by my Rottweiler. How fast would you run if your arse depended on it? Now imagine the same chase, only you are carrying my other Rottweiler on your back, how much slower would you be?’ The minute my finances could survive it (1989 as it happened) I’d part-exed my FZ750 for a used 1987-model GSX-R and substantial financial commitment. Riding home was interesting. None of my previous café racer’d two strokes, Harris Magnums or anything really prepared me for the GSX-R’s riding position. That long stretch over the tall tank to the low bars was one thing, but it was the forward and high-set footrests that pushed knees into armpits that didn’t add up. Uncomfortable doesn’t begin to describe it. Other bikes were uncomfortable, this added unconventional into the mix too. On the open road it was astonishing. Fast and torquey like nothing else I’d ridden, but nimble too, feeling like what I imagined a proper race bike would as it flicked from left to right on the smallest of rider inputs. The fairing was big enough to fit a fishtank between the clocks and those huge – but desperately ineffective - headlights meaning three-figure speeds became scarily common. My average time from home to work; 13 miles of rush-hour lunacy on the traffic-light splattered Leeds Ring Road dropped from 30 minutes to well under 20 minutes, which was ridiculous. The GSX-R’s performance obliterated every other bike I’d ridden. Everything about it was OTT. The acceleration was terrifying, brakes were incredible (but in comparison to my previous bikes they didn’t have much weight to stop), the suspension felt sophisticated, controlled and had some high-tech electric anti-dive function that I didn’t really understand. The built-in steering damper promised to make up for the missing 90mm of wheelbase without making the steering feel too sticky and the 150 section rear tyre looked like it’d block out the sun. For the first few weeks I got stopped roughly once a week and told to get rid of the offensively noisy V&H race pipe. I bought a secondhand standard system from a racer. Fitting it required removal (and breakage) of the enormous oil cooler so I needed a secondhand one of those too. Ten miles from my work was the biking playground of the Yorkshire Dales and at 5pm, instead of heading home I’d go north, for a couple of hours riding far beyond my limits. So much so that by the end of the summer I was frazzled and scared. A mate of mine had been seriously hurt after crashing his GSX-R and I was convinced it was only a matter of time before I joined him. Surely it was better to ride at 80 per cent of my ability and enjoy 30 more summers than continue like this and be lucky to see my 26th birthday? So I sold it and bought a Yamaha TDR 250. I’ve had big sports bikes since, but never another summer like that one. Which means that right now, in my early fifties I should be lusting after an early GSX-R1100 to revisit my golden year. And every now and then I do have a look. Five years ago you could take your pick for £2500, but now, you’ll pay three times that for a decent example because the rest of the 25 year-old class of 87-89 apparently have less self control than I do. If that’s you, then remember that buying a 30 year-old sports bike is tricky. That firebreathing race-developed engine will feel slow-revving, fluffy and hard work these days and, you’ll have forgotten that it only has five gears. The tall chassis, crude (by what came after) suspension and skinny tyres make tight, bumpy corners interesting and the riding position is almost unbearable for a fifty year-old body after 30 miles no matter how fit you think you are. But it will be the brakes that seal the deal. What felt so good in 1986 now feels downright dangerous on a bike still capable of a million mph. Partly because of the 30 years of wear and tear, but mostly because braking technology has improved so much more than we realise. The big GSX-Rs had a reputation for reliability, but at this age, almost anything could be knackered and most on the market seem to be in the ‘blimey, is it worth this much’ chancer end of the market rather than the ‘thousands spent on a concours restoration’. So be patient and find a bike that has had the suspension, electrics, brakes and fuelling sorted. Remember too that standard exhausts are scarce, so replacing that Motorhead-tribute race pipe with something that’ll pass an MoT could be harder than you think. None of which should stop you buying an early GSX-R because classic bikes are all about the emotion, not performance and, truth is a good 1986 GSX-R1100 will run rings around any bike built before it. Prices are only going to continue to rise, but the big spurt has been and gone so don’t buy one as an investment – get a Yamaha FZR1000R EXUP instead because they’re the next 90s bike to appreciate.